What is another word for Issued? media, instruments, issuing, data, posts, released, issuance, Emitted, makes, published, granted, Delivered. 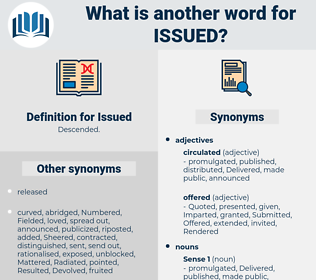 reissued, subject, used, Regulations, subscribed, declarations, pursued, ascertained, Distributing, Policies, documentation, materials, Attributed, publicised, Discussed, entrusted, recognised, surrendered, Stipulated, laissez-passer, advised, seized, suggested, forthcoming, Devised, unveiled, rescued, implemented, articulated, Instituted, holders, transmitter, instructed, imposed, dispersed, Participated, featured, confiscated, Arose, specified, Filed, Enunciated, acknowledged, proposed, represented, demonstrated, Surfaced, designed, Communicated, acquired, emit, disclosed, expressed, estimated, statement, finalized, update, discovered, Gave, executed, executes, presented, endorsed, provide, recognized, Mentioned, unsealed, allocated, accused, saw, Introduced, Deposited, forward, Forwarded, included, Examined, dispatched, outlined, judgement, recorded, Records, identified, Undertook, settled, Consigned, described, dismissed, spoke, Indicated, assigned, Remitted, Detained, declaration, pronounced, approved, spent, addressed, calculated, section, ruled, pointed, Originating, preliminary, struck, no., Cited, Deployed, extended, documents, Served, voiced, Caught, raised, sought, postponed, posed, experienced, Worked, Offered, Convened, proclaimed, edited, finished, Resulted, briefed, figured, sold, restored, Fielded, Incurred, awareness, moved, Displayed, uttered, Consented, stopped, Wrote, reserved, invited, requested, Transferred, judgment, informed, Enacted, Shipped, Appeared, recommended, Sentenced, Wished, selected, organized, credited, Enjoyed, pledged, nominated, objects, revealed, Contributed, Began, Pioneered, Commenced, initiated, Arrived, condemned, Streamed, involved, drove, conferred, listed, declared, over, assumed, Helped, dictated, Emanated, commissioned, Tendered, spear, monitored, Told, concluding, inscribed, Embarked, dictation, reunited, Referred, showed, product, formulated, shot, built, conveyed, delayed, admitted, Was, Were, Appealed, stuck, Inflicted, ratified, Yielded, Launched, Leaked, effected, committed, fired, come, Came, Remanded, Visited, intended, defined, council, rejected, Toured, Enabled, completed, cast, noted, turned, engaged, Commented, Generated, Passed, signed, Became, replaced, Captured, relayed, HIT, agreed, Floated, conceded, Followed, directed, reflected, min, Embraced, recovered, know, lance, bearing, honoured, Denied, considered, shared, aired, joined, covered, realized, Emerged, Grants, Brought, Created, Approached, allotted, advanced, accepted, Levelled, Promoted, papers, left, Occurred, Reached, Returned, welcomed, heard, Proceeded, Voted, ut, found, maintained, charged, Asked, attended, held, tabled, tables, forged, taught, Killed, Spanned, concluded, Drafted, Warned, Relating, Happened, started, learned, Dealt, forum, day, stated, attached, Picked, opened, topped, felt, contacted, paid, hosted, branch, elaborated, Gained, earned, ordered, handed, called, traveled, travelled, rolled, Carried, proved, put, paved, awards, Toped, placed, played, Claimed, Talked, dropped, Grabbed, Entered, Waged, drawing, drew, Accorded, final, mounted, led, won, funded, headed, throw, Threw, failed, added, founded, ", Met, form, laid, board, Flowed, civil, said, Had, Went, pulled, read, shed, formed, kept, based, Looked, let, Took, date, Meant, Got, wanted, 21, Did, thought, Questioned, posts, released, transmitted, makes, published, granted, pre-published, Delivered. 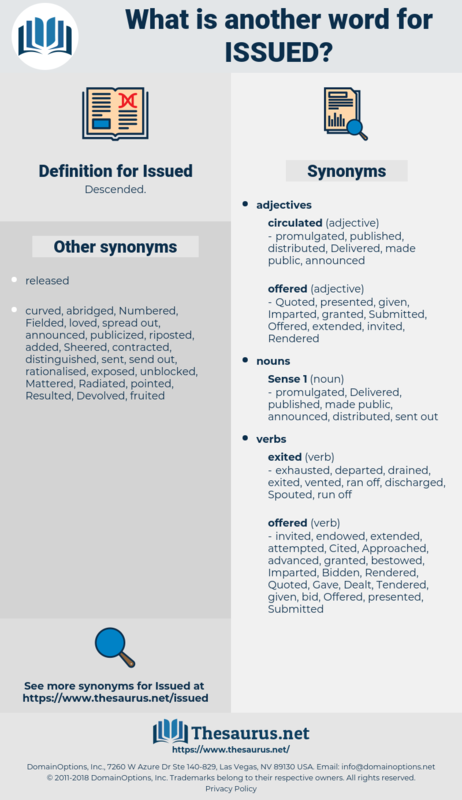 reissued, questions, Been, Subjected, used, substantiated, prepublished, revised, situated, Guidelines, exactly, subscribed, pursued, Exercised, Disbursed, ascertained, relinquished, documentation, pubished, Attributed, resolution, publicised, Discussed, entrusted, Administered, recognised, surrendered, measured, preferred, televised, Legislated, speakers, advised, seized, publicized, suggested, directive, certified, organised, forthcoming, diffused, guaranteed, reintegrated, Devised, unveiled, registered, expenditure, implemented, Enshrined, articulated, Extradited, continued, telecast, Instituted, Denominated, consolidated, Intervened, verified, equipped, instructed, imposed, Arisen, EUR, Participated, featured, sub-commission, confiscated, perceived, specified, Filed, sustained, reprinted, acknowledged, Comprised, accomplished, supported, proposed, represented, journaled, demonstrated, processed, designed, Communicated, acquired, insured, increased, emit, disclosed, destined, expressed, tested, estimated, passports, updated, statement, understood, seen, apportioned, finalized, incorporated, witnessed, concerned, discovered, invested, Supplemented, facilitated, undermined, executed, presented, endorsed, recognized, Retrieved, Mentioned, unsealed, allocated, accused, Introduced, classified, payments, Deposited, guided, Forwarded, designated, included, Examined, Refused, Shown, foreseen, administrative, Radiated, Compiled, proprietor, spearheaded, dispatched, outlined, stretched, manufactured, unleashed, judgement, confirmed, recorded, triggered, identified, Explained, guidance, Exhibited, spoken, settled, Consigned, described, Summoned, Inaugurated, dismissed, euro, scheduled, Eliminated, Curtailed, Contemplated, Indicated, assigned, Originated, Remitted, entitled, Detained, declaration, pronounced, approved, qualified, forecast, bestowed, spent, addressed, calculated, disposed, ensured, Excluded, ruled, pointed, struck, reviewed, Cited, entrenched, Deployed, document, documented, improved, enclosed, extended, Seemed, Waited, documents, scattered, Served, voiced, auctioned, Caught, raised, sought, collected, desired, dedicated, postponed, posed, experienced, Aimed, Worked, Offered, Convened, focused, notice, Harvested, Devolved, withdrawn, edited, fed, ordained, Constructed, Resulted, empowered, Viewed, sold, Forgiven, arranged, Ascribed, written, restored, composed, appointed, Fielded, Incurred, request, cancelled, moved, Displayed, Propagated, stopped, exposed, reserved, deferred, invited, requested, Transferred, judgment, Earmarked, Undergone, informed, goods, Gazetted, Enacted, Shipped, stemmed, Appeared, recommended, Sentenced, rotated, selected, excellence, removed, permit, mandated, stamped, Imparted, assured, attained, governed, enforced, organized, credited, expanded, Enjoyed, driven, pledged, nominated, renewed, obliged, revealed, Contributed, Commenced, PUBL., Translated, expected, initiated, Arrived, condemned, involved, secured, divided, conferred, grouped, listed, Begun, declared, associated, liability, assumed, devoted, reduced, Helped, dictated, commissioned, Tendered, Quoted, Targeted, anticipated, inscribed, Embarked, Managed, Phrased, arrested, reunited, Referred, compliance, formulated, built, Meted, charter, Poured, conveyed, Repaid, Responded, delayed, admitted, Operated, Spilled, Appealed, stuck, located, Regarded, ratified, Yielded, connected, Launched, effected, Fought, committed, fixed, decree, decreed, fired, chosen, come, Visited, vested, motivated, discharged, intended, handled, defined, council, accompanied, bound, rejected, become, amended, reference, Enabled, Omitted, completed, cast, noted, turned, engaged, validity, Generated, Passed, signed, projected, Deemed, annex, advice, escaped, Captured, HIT, Couched, Upheld, Spared, known, agreed, *, conceded, Followed, directed, reflected, Betrayed, imported, Embraced, recovered, opinion, changed, honoured, rid, director, Denied, linked, considered, absorbed, shared, aired, dumped, covered, convicted, realized, Emerged, traced, page, Brought, Created, born, Borne, Approached, allotted, advanced, accepted, authored, sounded, Levelled, Promoted, planned, card, left, Occurred, affected, Reached, framed, Returned, refunded, heard, Voted, modified, found, maintained, Channelled, charged, Asked, respected, treated, attended, held, tabled, forged, taught, Killed, Spanned, concluded, trained, Drafted, Warned, carte, Happened, started, learned, Dealt, uploaded, cleared, trapped, filled, Worded, stated, Lodged, attached, Picked, opened, topped, Taxed, felt, contacted, Afforded, order, paid, beaten, elaborated, type, travel, Gained, earned, blamed, forced, ordered, handed, called, blocked, traveled, travelled, rolled, text, Carried, closed, proved, proven, put, loaded, placed, played, Claimed, drawn, Talked, dropped, Entered, marked, -rrb-, Accorded, thrown, sorted, mounted, led, won, funded, headed, have, Has, failed, added, founded, ", freed, Met, laid, letter, taken, map, Mapped, grown, said, Had, read, shed, formed, kept, based, Looked, 23, Acted, gone, 19, 1998, Accounted, 2004, fallen, Gotten, date, Meant, Got, 21, tried, 15, named, thought, Questioned, released, Emitted, transmitted, published, granted, Delivered. About two hours before sunset the order was usually issued for the prisoners to carry their hammocks, etc. Nor only that; but as we issued, they made no way for us, and those of the Assembly who had already gone down, had to walk along the skirts of the press to get to the inn.